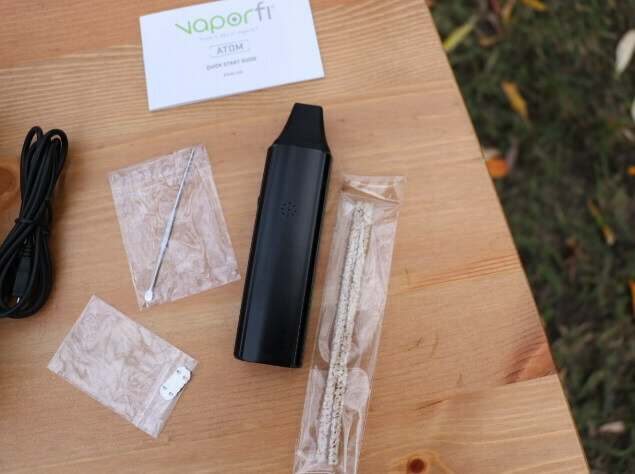 VaporFi Atom Vaporizer Review: A New Best Portable Vape? We took several days to test out the features of VaporFi’s innovative new vaporizer. The Atom is so exciting because of its wealth of features, some of which are the most advanced in the industry, such as a motion sensor and a 3000 mAh battery. The Atom is the latest flagship vaporizer introduced by VaporFi. It is a modern vaporizer that comes with several innovative features. Foremost among the advancements in this model are the integration of motion-sensing technology and the inclusion of a 3000 mAh battery. Our experience using the device was incredible. We’ve compiled a detailed review for prospective users below, so read on to see the benefits and drawbacks of the new device. The heating chamber is designed from ceramic and is quite spacious. The chamber has been placed at the base of the gadget and will hold enough for several long sessions. Because of the position of the ceramic chamber, air runs openly through the stainless steel air path, which allows for incredible vapor taste. As a nice side-note, the mouthpiece is certified as 100% food grade. The Atom has been given a huge 3000 mAh battery. This means that you will never run out of charge while using the vaporizer on the go. The LED temperature marker displays a purple light while warming up and a white light when the vape is ready for use. The Atom has a modern design, an all-black body with sleek edges and rounded corners. It follows the popular minimalist design trend, without any gimmicks attached. 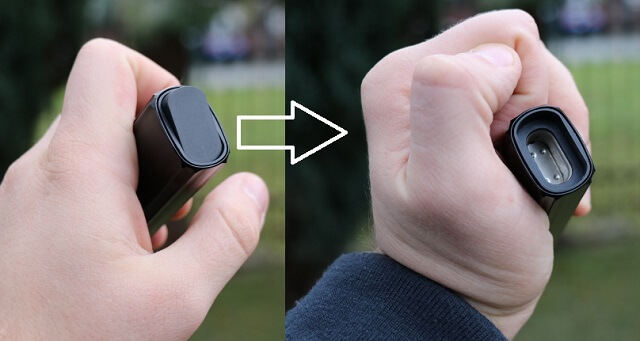 The vaporizer can easily be held in the hand and carried around in the pocket, giving it high scores in the discreetness department. Unlike some other models in the market, the atom does not compromise on functionality or convenience despite its small size. The product has a smooth finish that gives the device a very premium feel; it will definitely impress your vaping buddies. Maintenance for the Atom is both crucial and simple. The cleaning pipes that come with the vaporizer are used to keep the item spotless so that you get a clean, powerful draw with every use. If the cleaning pipes are lost or damaged, a dedicated five pack can be purchased on the official website. Cleaning the vaporizer regularly will ensure a long life span. Oven Door – Again, this comes preinstalled in the device and requires no technical knowledge to use. A replacement screen, which would definitely come in handy after a prolonged usage of the device. A pair of cleaning pipes to keep the vaporizer in shape. A micro USB cable to charge the battery. An instruction manual to get you ready with everything needed to know about the device, its handling, etc. 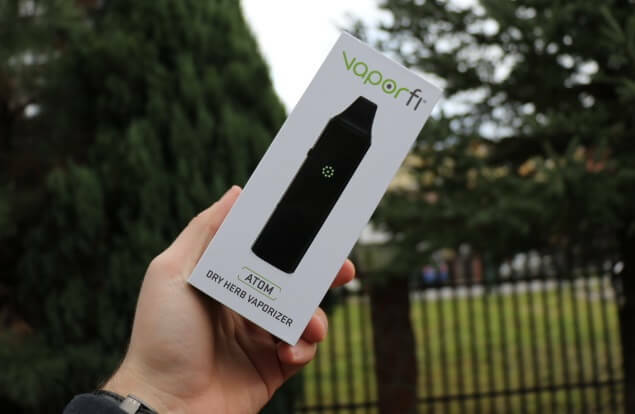 Upon purchasing the Atom Vaporizer from the official website VaporFi will five a 30-day money back guarantee to be used if there are any issues with the item. Simply contact VaporFi and they will handle everything for you. VaporFi is an American brand through-and-through. It’s a subsidiary of the International Vapor Group, which owns brands like South Beach Smoke and Direct Vapor, one of the biggest entities in the industry. VaporFi follows through on its motto of changing the way people smoke. It has an e-store with a growing customer base and a wide variety of products. Any product coming from VaporFi can be trusted to be great quality. The brand is backed by an experienced team of designers and engineers who are determined to bring you the best product every time. What sets VaporFi apart from other competition is its strong focus on customer service. Their attention to detail makes customers feel like they are truly purchasing from a high-end, reputable brand. On the whole, the Atom Vaporizer from VaporFi receives major accolades from our review team. While it may not be as small or flashy as other comparable vaporizers, what it lacks in aesthetics it more than makes up for in its functionality. The Atom, while new, is bound to rocket to the top of the best vaporizers lists in the vaping community. Enjoy. The ePuffer Cosmos Dry Herb Vaporizer can vape herbs as well as loose leaf tobacco and comes in a stylish and portable design. Read our review here. The Utillian 651 vaporizer is an updated version of the 650, but this update comes with three temperature settings and a ceramic chamber. Read on here. Love my Atom. Did the research, read the reviews, and I must agree with the positive user feedback. Quick heat up, easy to use and maintain, nice flavor and vapor. A step above the rest for this price. Kudos to VaporFi.